My little boys' bedroom has been sitting in a state of partial completion for the last 3 years. And it's finally time to finish it up! Here's the catch. I have to do it for little to no money. And today I'm going to share with you how I plan to do that. But first, a few photos of the room in its before state. Don't get me wrong. The room is cute. And I like it a lot. There are just things that need tweaking...and definitely finishing. For example, the ladder in the above photo was meant to be temporary - which is why it isn't painted. But three years later, and it's still there. So it is going to change. 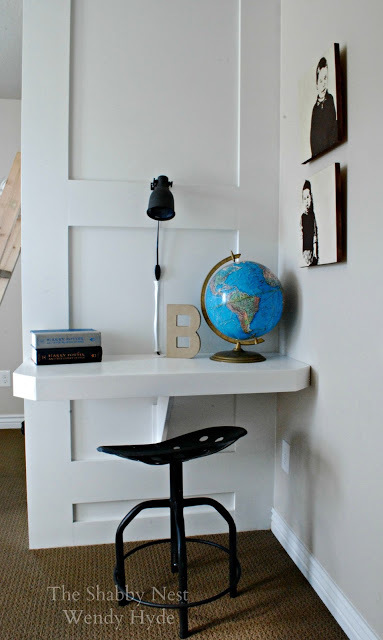 I absolutely adore this built-in desk at the end of the bunk bed. It will not change...although it is currently really messy and definitely needs to be cleaned up and organized. Although I don't think the bedding will change, I will probably mix it up some. One of my secrets to inexpensive decorating is keeping an inventory of things I have used in the past. I like to mix things up periodically, so rather than getting rid of the old stuff - as long as it is still in good shape and I like it - I store it for potential future use. You'll see what I mean when I re-style the beds. So one of the saddest things is that my little boys aren't so little anymore. I sold this adorable teepee because they had outgrown it. 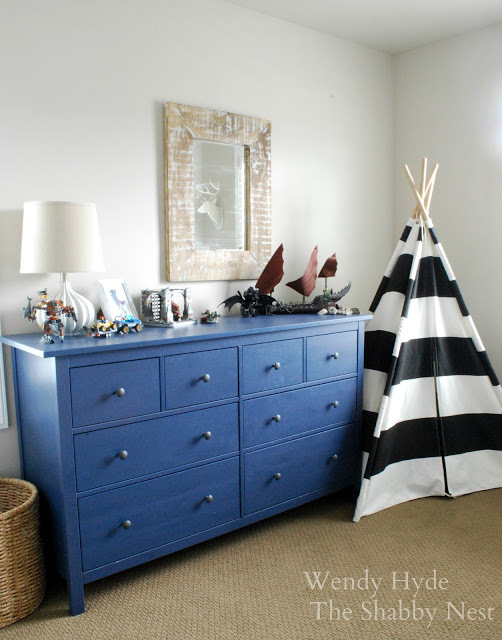 But the dresser is still in their room and will remain, as will the mirror. I'm thinking of mixing up the lighting and maybe adding in some seating, but that will depend on what I can find. 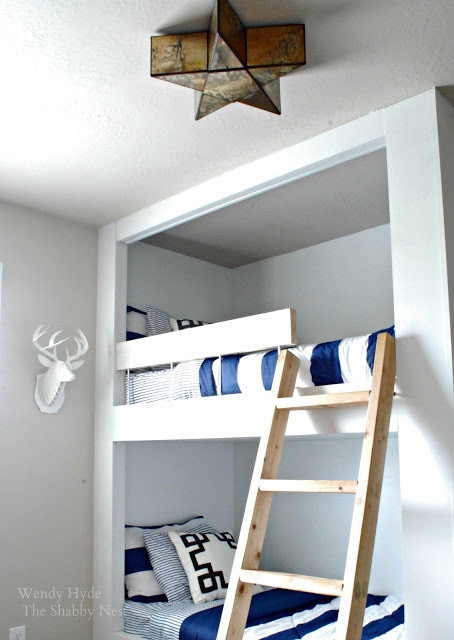 Add some color to the bunk beds. I am currently thinking of painting the interiors of the beds. And I am definitely thinking of mixing up the bedding a bit to add some interest. Add some organization to the space. The boys need some storage at the desk and some toy storage as well. Add some window treatments. I've actually had something in the works for quite a while for the windows and I just have to get it finished. Add curtains to the beds. 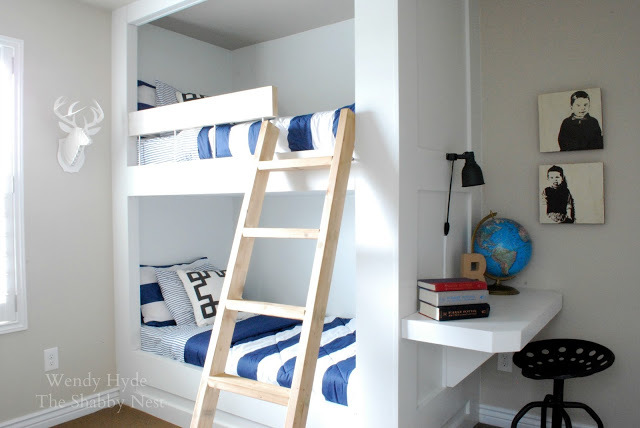 I have been wanting to add curtains to each individual bed, but I have had an idea to reuse the curtains from the loft bedroom of our previous home that I think will work well. To read all about the loft bedroom click here. 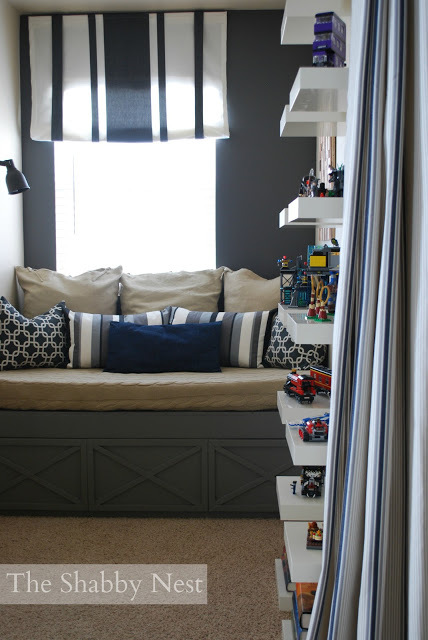 I hope you'll follow along as I refresh the boys' room. I promise to share with you all the ways I save money in the process!